This guide primarily supports students in Rady's MS in Business Analytics program. Other researchers may find it useful if they are looking into analytics, big data, data visualization and similar topics as they relate to business intelligence and strategic management. Use the tabs to navigate the resources. Items included here range from academic journals, industry analysis, data and software resources, reference materials and news sources. 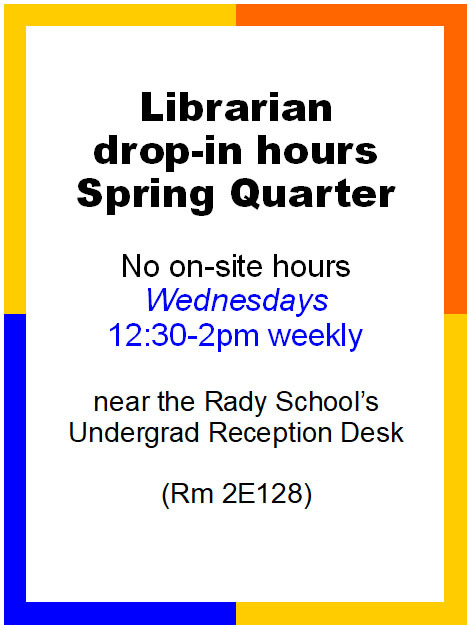 NOTE: Drop in hours re-start on April 17, 2019 for Spring Quarter. Also, meetings are available by appointment. This guide has links to the broadest range of data resources you have access to. Although this guide originally was for undergraduates, it contains links to materials of interest to a range of readers who range from beginner through advanced level with Excel. includes sub-topics like advanced analytics, business activity monitoring, business pattern frameworks, content analysis, pattern seeking, predictive analytics, sentiment analysis, social analytics, speech analytics, supply chain analytics, text analysis, web analytics and more. Cutter is a service that analyzes global trends in business technology, including data analytics and digitial technologies. Some of Cutter's content is free, but to see the industry reports that come with our UCSD membership, you must register for an account. Instructions are here - http://blink.ucsd.edu/sponsor/ITS/services/cutter.html. Please use your ucsd.edu email address to register. Below is the latest RSS news feed of contents from their blog. These links lead to materials in our collection about these topics, such as books, ebooks, journals, reports, dissertations and videos. Thanks to Sunny Solanki, who contributed extensively to the creation and contents of this page.